Makar Sankrant is just around the corner. It marks end of winter solstice. It is believed that the Sun starts moving towards Northern Hemisphere on this day by length of one sesame seed! This is the only festival in India is celebrated by Solar calendar, all others are celebrated according to Lunar calendar. It is celebrated all over India. It is called Sankrant in most of Northern India and as Pongal in Southern India. 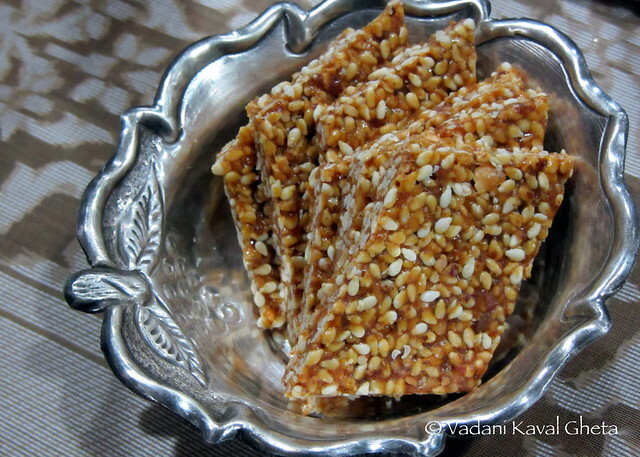 It is winter time in India in January so Sesame seeds are used in abundance. It is believed that people should eat more healthy oils during winter time to fight cold weather. Jaggery produces heat and believed to be better for health if eaten during wintertime. Making chikki or brittle is easy but can be tricky. It needs little patience to make it crispy and not chewy. Here is my mom's recipe which she learned from my grandmother (her mother-in-law). My mom makes the best chikkis ever! I learnt to make these from her when I was in college. And easiest available ingredients to practice were churmure/kurmure (puffed rice) or roasted peanuts. And growing up in a sugarcane capital of Maharashtra helped because we always had organic jaggery in abundance at home! Pick over sesame seeds and dry roast them on low heat. Seeds will plump up once they are roasted properly. Do not let the seeds burn. Set it aside once roasted. Grease stainless steel plate (10-12" diameter) and a flat bottom stainless steel bowl with little ghee or walnut oil). Add jaggery in a heavy bottom pan, add about 2 tbsp water. Start heating jaggery water mixture on low-medium heat. Do not increase heat as it will burn jaggery quickly and color of the final product will be darker. 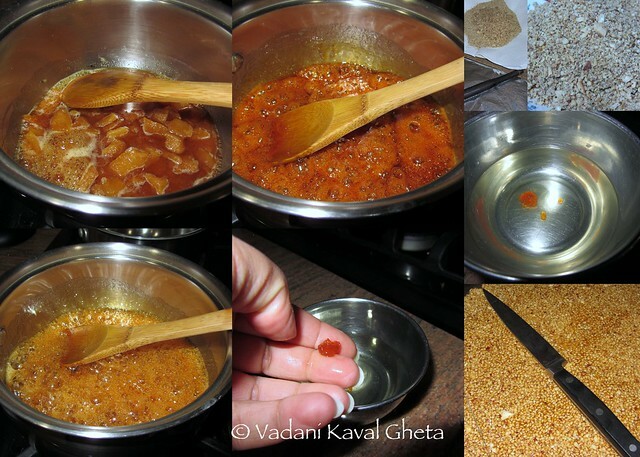 Soon the syrup will start boiling (4-5 minutes), keep stirring to avoid burning the jaggery. Syrup will start bubbling. Take 1/2 cup water in a separate bowl and drop single small drop of syrup in the water. Move the drop in water to cool it. Now see if that has become hard like candy. You can try chewing it. If the ball does not stick to your teeth and is crunchy then syrup is ready. If it is chewy then keep stirring on low heat for couple more minutes and taste for the crunchiness by adding another drop in water bowl. Once syrup is ready add 1 tbsp ghee or walnut oil and mix quickly. Remove the pan from heat then add roasted sesame seeds, peanut powder and dry coconut and quickly mix everything. It will form a ball, quickly pour that in greased plate and flatten with back of a greased bowl. You have to work quickly as jaggery will start cooling off quickly making it hard to work with. Once the surface is flat and the thickness is even then using sharp knife cut into diamond shapes without going through the brittle. Let it cool completely (3--40 minutes) and then make the pieces on the scorched lines. Enjoy! They last for more then 15-20 days if stored in a airtight container. The process sounds tedious and lengthy but start to finish it takes maximum 30 minutes. Making the candy consistency of jaggery is the key. Do not rush through that step. I usually make it in a non-stick pan and at the end of the process my pan is clean as it it was never used. I cover my large cutting board with aluminum foil and grease that and a rolling pin with walnut oil. And roll it quickly to make thin (1/4 centimeter) brittle. I have never used candy thermometer to make these, if you use it, please drop a line about that process.